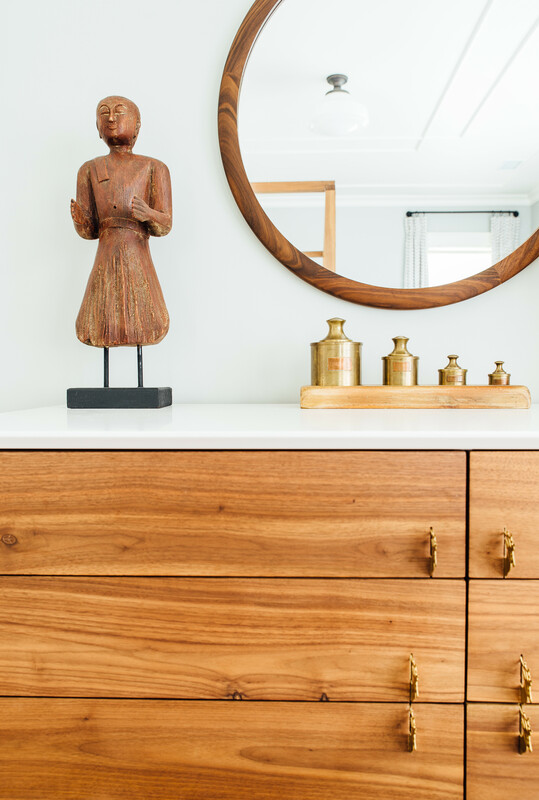 Interior designer Cortney Bishop created a warm and modern beach home by combining pieces that incorporated both refined masculinity and an homage to the past. 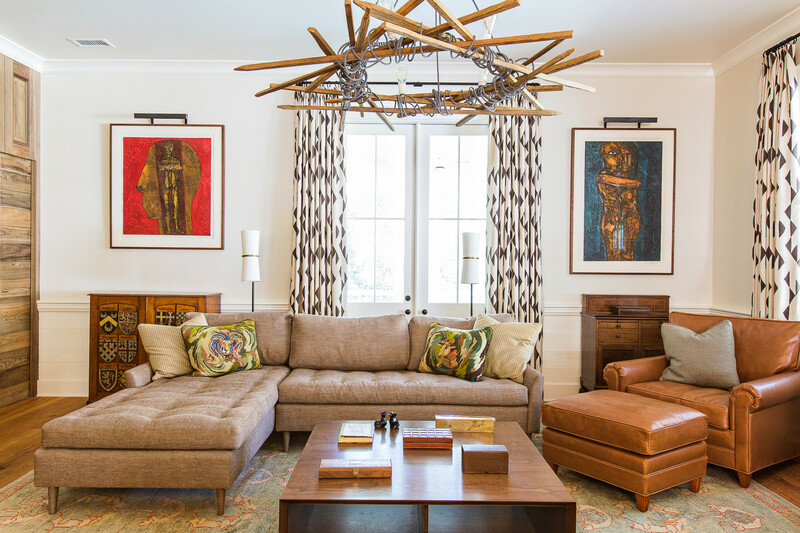 In the family room, an Old Modern Objects tobacco stick chandelier holds center court to the traditional Ralph Lauren leather chair and ottoman and the Verellen leather sectional sofa below. All photos courtesy of Cortney Bishop/Andrew Cebulka/Katie Charlotte. WWhen it comes to designing a beach home, there is the obvious route and then there is the road less taken. Sea shell accessories, shades of misty blue hues on the walls, and a beige slip cover on the sofa to hide the sandy leftovers are typical, if not traditional, requests associated with water-front properties. So when interior designer Cortney Bishop’s longtime clients commissioned local Charleston architect Hunter Kennedy to custom-build their home— a mere three blocks away from the Atlantic ocean—she knew this space was about to chart new territory. The mix of different time periods and refined textures are what bring each space to life. It wasn’t that her clients weren’t traditional, far from it. 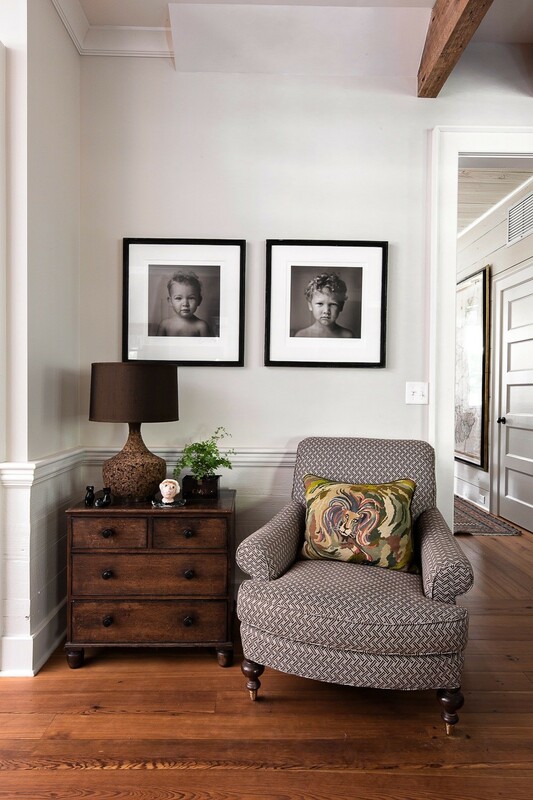 “I like to say that they are a modern southern family who appreciate those time-tested southern values,” says Bishop of the homeowners, and their two young boys, who travel the world for pleasure, often picking up design inspiration throughout every trip. "Their tastes combine the wife’s love of worldly, ethnic art and influences along with her husband’s appreciation and great knowledge of furniture design—especially mid-century modernism.” The homeowners came to the table with their personal collection of art, vintage rugs and furniture, and an edited selection of accessories from their travels to make the home sing. Comfortable, practical, and most importantly, unique were the terms inflicted upon the designer to give this brand new home an old soul. 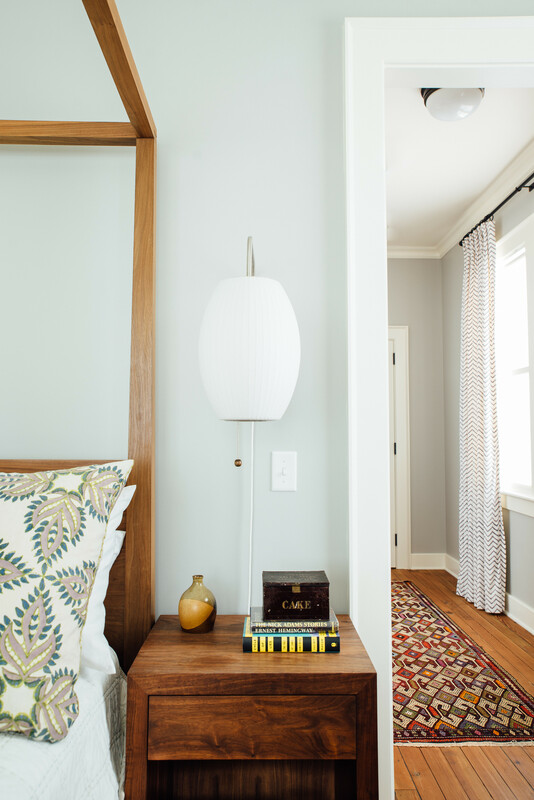 A cozy corner in the breakfast nook combines art and plush seating from the owner’s personal collection and a vintage chest and lamp that were found by Bishop. 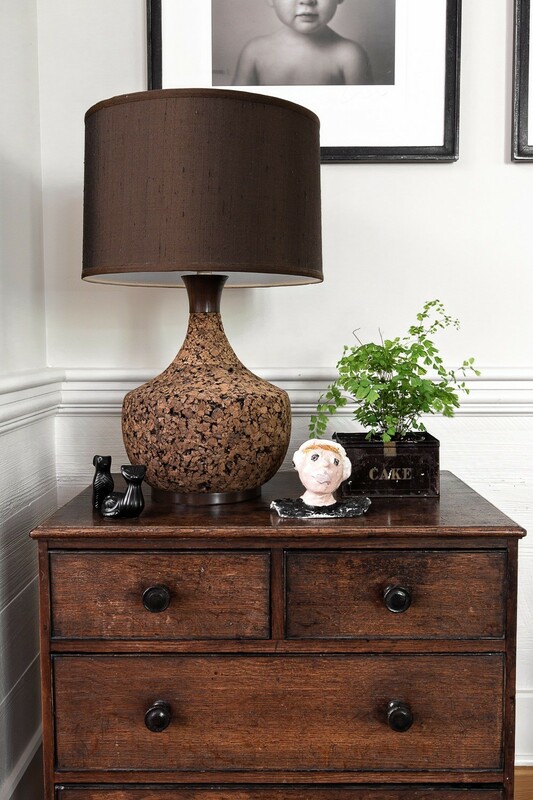 Artwork, made by the homeowner’s children, are proudly displayed on a vintage walnut chest of drawers. Coming in off the wrap-around porch, the home opens in typical southern fashion. A grand plantation-style hallway with pine flooring repurposed from an old church, unfolds throughout the entire first floor. In front, the formal living and dining room are traditional in nature, perfect for entertaining but not necessarily spaces that the entire family can enjoy. So, in the back of the house, the walls were removed, creating an open floor plan that combined the large, custom kitchen with the laid-back family room, allowing the family to spread out yet still be together. The dining room is another space in the home that combines a mix of artwork that the homeowners have collected throughout the years, custom furnishings, and vintage accessories that help give this room a story of its own. 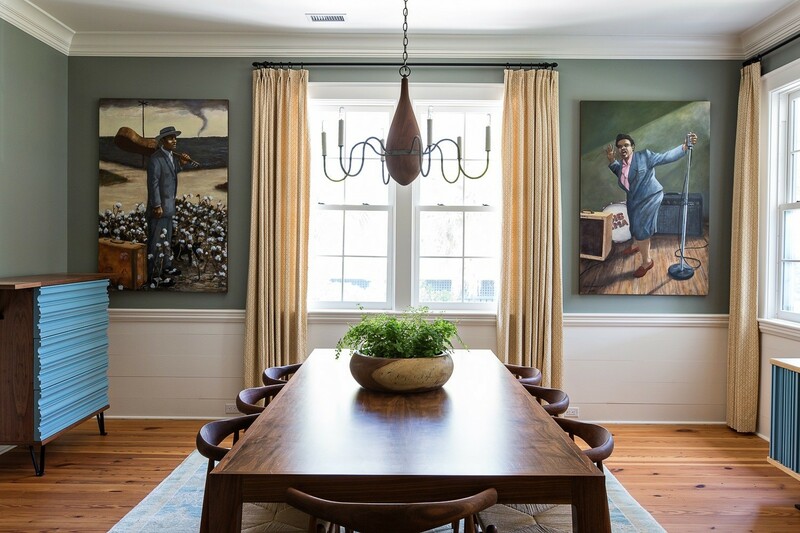 Both paintings are by local Charleston artist David Boatwright and the curtains are by Katie Leede. Vintage accessories collected by the homeowners give the room the personal touch they requested not only in this space, but throughout the rest of the home. The nightstand was custom-made by Peterson Antiques and the light above is vintage. The biggest reward, with any project, is that point where I’ve gained my clients trust. One place where she didn’t have to push her edgy agenda was in the kitchen. The savvy home owners requested the subdued yet bold-in-choice hue on all of the cabinets. The color, to Bishop, made sense and elevated the overall design of the home while, at the same time, balanced the eclectic and collected interior. “We allowed their ideas to unfold into ours and in the end, we presented something that is completely unique to them,” she says. “The biggest reward, with any project, is that point where I’ve gained my clients trust.” Eventually, the brand-new home by the sea didn’t seem so new, after all. The modern translation of Bishop’s design recoiled simply into more personality and less proximity—the culmination of a true southern charmer.